Cookies are quite possibly the most enjoyed edible, whether marijuana infused or not, in the United States. Cookies are a treat to bake and a treat to enjoy as well! Cookies can be enjoyed at any time of the day- with milk at tea time or at midnight in your pyjamas. There area hundreds of different ways to enjoy cookies; hard or soft, smooth or crunchy, sweet or plain. Anyway you like to enjoy your cookie is possible- which is why baking marijuana infused cookies is one of the favourite ways to enjoy cannabis infused edibles. Hot outside? Dip your cookie in a glass of chilled milk. Cold outside? Dunk you delicious cannabis infused cookie into a mug of something warm. Among the thousand of varying cookie recipe there is the Snickerdoodle cookie. This Snickerdoodle cookie is an unequivocal American cookie to be enjoyed best with a delicious infusion of cannabis. 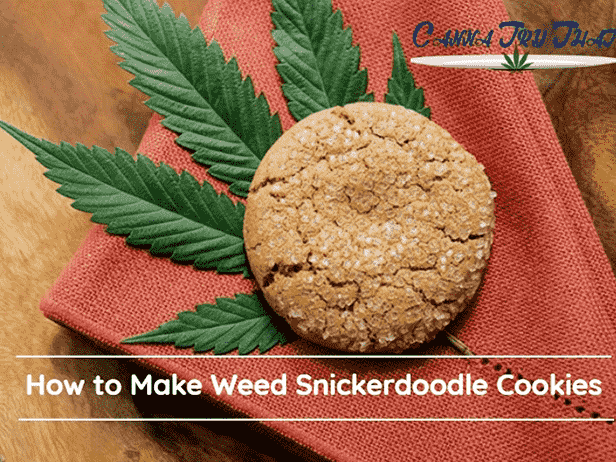 These Snickerdoodle cookies are made using butter so in this recipe you will find cannabis infused butter. The first thing we need to do is to ensure that you have the best possible weed butter. The fact of the matter is this: your butter will only be as good as your weed. If you want to keep it mild so that you can use it on a regular basis, say with your morning pancakes, that is fine. Good weed doesn’t have to mean the strongest, it just means the best quality- pure and without any excess chemicals. Do your digging and find a good source for your bud, keep it clean and you will reap the benefits. Here are a few simple steps to get you making your own cannabis butter. To get the perfect weed butter you need to ensure that you use the heat gradually and consistently. The heat is used to stimulate the THC (this process is called decarboxylation). This stimulation ensures the THC becomes fully active. Preheat the oven to approximately 240°C. Spread your bud on a baking sheet and place in the oven your about forty minutes. Rotate the baking sheet a few times throughout the process to ensure sufficient and even baking. Once the bud crumbs easily between your fingertips then it is ready. Place about 250ml of water in a saucepan and bring this water to boiling point. The amount of water is not so strict0 the important factor is that the marijuana floats about 2 inches above the bottom. Once your water has come to a boil allow the butter to melt in the water. How much butter you ask? That depends on how much marijuana you are want to use. Or vice versa. For every once of marijuana you should be using around 4 sticks of butter. 3.Add the dried weed once the butter is fully melted. Turn down the heat. The heat should be lowered significantly and the mixture is simmering gently. This process is an infusion so the slower and longer you allow it to infuse, the better. A minimum if three hours is suggested on a very low heat. You will notice that it turns rather thick and almost shiny. While the mixture is infusing, get a container ready to pour in the ready mixture. You are going to want to drain the mixture so it is best to use a cheesecloth over the top of the container. Pour the mixture into the container, through the cheesecloth. Once you have poured everything, squeeze the remains in the cheesecloth to squeeze all the infusion into the container. Now you need to let the marijuana infused butter cool down. You can put the container in the refrigerator to speed up the process. The butter will solidify on the top of the mixture. The THC and other active cannabinoids are now fully infused in the butter! By now you should already have made your special cannabis butter- if not do that first! Slice a stick of cannabis butter and place it in the mixing bowl. The Colorado is be a slightly army green colour because of the marijuana. Slice the butter into smaller pieces and if you think you will need a little bit more than add some extra. You need to melt the butter so use the microwave to do this if you need to. Take out your ready mix Snickerdoodle cookie mixture and add to the bowl with the now melted butter. Blend these two ingredients well- you don’t want any lumps. now add the egg to this smooth mixture and mix everything together well. Your dough though become quite thick with a greenish tint. You now take a small size of dough to roll in the palm of your hand into a small ball. Now roll this dough ball so that it is dusted with a layer of cinnamon sugar. Place the ball onto the cookie tray. Continue making these little balls until you have used up all of the dough. Your oven should be at the right temperature by now so you can place the trays inside the oven. Keep the trays stacked one on top of the other. Allow the cookies to bake inside the oven for at least 8 minutes. The baking time variates between 8-12 minutes. Keep an eye on the cookies to see how they are browning and to ensure that they do not burn. Once they have baked sufficiently, remove the trays from the oven and set them aside to cool. The cookies should be slightly brown and smell delicious! The colouring should be golden (okay, more of a yellow than a gold) and dotted with brown spots. Once the cookies are cool then put them onto a plate and get yourself into a comfortable position. If it is a nice summery day then sit outside with them and settle into nature as you enjoy your freshly baked Snickerdoodle cookies that will ensure you get just as freshly baked.